I’ve gone and got myself another hat to wear – I am now running the CILIP Yorkshire and Humberside Member Network blog. If you’re a local CILIP member you should definitely check it out and start following it to find out more about our events and activities. Even if you’re not a CILIP member you may find it interesting – and some of our events are open to non-members too. Click here to read the blog. So last week I went to LILAC for the day, to present my MA dissertation research to a roomful of enthusiastic librarians, which you can read more about here. I spent the rest of the day being an enthusiastic librarian instead! I went to lots of other parallel sessions during the day, as well as the keynote speech, but for this post I want to focus on just one session I enjoyed, because otherwise this would get far too long and unwieldy. The session was called “Hunting Assumptions: encouraging creativity and critical reflection through collaboration”. This was a two-pronged workshop – on one hand, it was a fun space to learn about activities that other people use in their teaching, and to swap ideas about how you could use them in your own teaching. There was also a more theoretical and challenging side to the workshop – the “hunting assumptions” bit. This was based on Stephen Brookfield’s 1995 book Becoming a Critically Reflective Teacher, and was all about being aware of your own assumptions about yourself or your learners – stuff like “this activity is too childish for my learners” or “all adults are self-directed learners”, which can stop you from considering new ideas or different ways of doing things. Once you identify your own assumptions you can start to challenge them, perhaps in collaboration with others who can bring a different perspective to what you’re doing. This idea of being critical and challenging your assumptions is, for me, an extension of what we were taught at library school about being reflective practitioners, looking deeper into the reasons behind the decisions we make and the bubbles we exist in. I’ve taken out a book from the uni library for the first time since graduating and am really looking forward to familiarising myself with Stephen Brookfield’s ideas and hopefully applying them to my own practice. This statement might be something trivial, like “Jane had a salad for lunch today”, or it might be something that might have more of an effect on your decision to kill/save that person, like “Jane’s future child will grow up to be an evil dictator”. Once you’ve received a thought bomb and read it, you can throw it over to a different group, so there’s thought bombs flying all over the room. These are intended to spark discussion between participants and get them to argue the merits of saving different people. It’s easy to see how this can a) get people thinking around a topic and b) be adapted for lots of different scenarios. You could go off in all sorts of directions with it – the inclusion of irrelevant statements in the thought bombs is a good starting point for a lesson on evaluating information, for example. We saw one example in the session which was geared towards researchers – the three people were researchers at different stages of their careers, using different methods to share their research (e.g. paywalled journal, open access journal, blog). The thought bombs were things like “Jane was caught bribing peer reviewers”. With a bit of tweaking, you could use this activity to get people thinking about the perceived “value” of different types of scholarly communication, and the different ways to reach an audience and have an impact. You don’t have to save/kill the researchers either! You could ask “who would you choose as your PhD supervisor?” or “who would you ask to collaborate on your research project?”.I really liked this activity, and since seeing the research examples I’ve been thinking of ways to incorporate it, or something like it, into the new “developing your research profile” session we are designing for our PhD students, as we really want it to be a discussion-based session and I think an activity like this would facilitate that. I just need to work out the details so it fits in with the messages we’re trying to get across. I was really glad I went to this session as (apart from being fun!) it dovetailed nicely with what I’m focusing on at work at the moment, and I’m definitely going to try and think more critically about what I’m doing and why. Last week I went to LILAC for the day. If you haven’t heard of LILAC before, I will briefly explain: it’s a conference about information literacy, and is mostly attended by librarians and researchers. It’s my favourite (in my very limited experience) of all the big events and conferences I’ve been to, because it’s got a very friendly atmosphere and there’s a real sense that everyone’s really happy to be there, and excited to share new things and learn from each other. I went last year as a volunteer for CILIP Y&H and loved it, so when I was accepted to present my own research there this year I was thrilled. Plus, the conference was at my alma mater Newcastle University this time round, so that made it extra special! I’m going to talk exclusively about my presentation in this blog post, but I will also be writing one about all the other sessions I went to, so keep an eye out for that later this week. My MA dissertation research is not something I really wrote much about on this blog, because I was stressing out about it way too much at the time. Now that a year has passed since I had to start thinking about it, I am able to talk about it with enthusiasm again! I wanted to do some research into how librarians think about themselves and their teaching. There’s loads of case studies out there about how librarians are implementing different teaching theories and techniques and devising cool new teaching interventions. “Teacher-librarians” seem to be a big thing! However, this didn’t always chime with what I was experiencing in my workplace – not all the librarians I met would call themselves teachers or say that what they were doing was teaching, let alone be doing all this innovation and stuff. I decided that I’d use my dissertation to find out more about how librarians viewed themselves and their roles within the institutions/environments they worked in. I used phenomenographic interviews to collect the data for my research. Phenomenography is all about getting deeper into what people are saying about things, to try and uncover their conceptions of things. You end up with a collection of different ways in which people experience or think about a certain phenomenon – in this case, themselves as teachers (or not teachers), their teaching, and information literacy. I created four categories, each of which describes a conception, and which is different/distinct from the other three. The idea is that librarians might be able to identify which category they most closely match, and this might help them understand their approach to the teaching they do and possibly identify ways to help them approach it differently (for example, go to a training session about teaching, to help you feel more confident about calling yourself a teacher, to help you feel more like the equal of other teaching staff at your workplace, to help you have a more productive relationship with them). After writing up and submitting my dissertation, my supervisor Pam encouraged me to think about publishing it or developing it further. Having been to last year’s LILAC, I really wanted to go back, and as my research is all about librarians who teach information literacy, it was a good fit. As is now obvious, my application was accepted and I was invited to give a 20 minute talk at this year’s conference. Hooray! The talk went really well – about 50 people watched! – and I was delighted by the number of people who came up afterwards to tell me and Pam how interesting they thought it was. It’s nice to think that my work is actually interesting to other people and not just me! Lots of people have asked whether they can read my research. My dissertation will be published on Sheffield’s archive at some point soon (not sure exactly when). We are also submitting an edited version to a journal, so if/when it is accepted and published I will share that online as well. In the meantime, if you’d like to get a copy of my dissertation, you are very welcome to contact me and ask for it. I’ve also put my presentation on Slideshare and embedded it at the end of this post; if you want to see what I said on the day, view the presentation notes on the Slideshare website here – just scroll down under the presentation and click notes (circled in red in the screenshot below). Enjoy! Outside of my job, I’m involved in “the profession” in various ways. I follow and talk to other library/information people on Twitter, I go to events and conferences, and I’m also on the committee for CILIP Yorkshire and Humberside Member Network. On Saturday, I linked up all of these activities: in my capacity as Student Liaison for CILIP Y&H, I collaborated with NLPN to put on an event in Sheffield for students and new professionals entitled “Get Career Ready” – and I livetweeted most of the day as well! (See #nlpnyh for tweets from me and other attendees). The day was a resounding success; our five presenters all gave really interesting and engaging talks, and there was lots of lively discussion throughout the day. Lots of people have said they came away feeling very positive about their careers and about the profession, which is always nice to hear. There was also a lot of homemade cake consumed, which always helps! Lisa Jeskins was our first speaker, talking about how people can get involved in special interest groups and committees and use this experience to improve their own skills as well as helping the group or organisation. She talked about her own experience of organising conferences and events (such as the LILAC conference next month) and encouraged us all to think about gaps in our skillset and what opportunities there might be for us to fill them. The talk also sparked a discussion about “yes-itis” – the danger of agreeing to do too much, and not being able to give enough time to each commitment. Next, three NLPN members gave short presentations which they’d submitted following our call for papers. Holly Singleton talked about her first management role, giving practical tips on how to get a job as a manager and how to cope once you’re in it! Lyn Denny shared her dissertation research about the reading preferences of young children (especially young boys), and explained how she’d applied her findings in a school library, with a bonus cute picture of her daughters and niece dressed as pirates and Spiderman! Katherine Stephan’s presentation was all about how she switched from public libraries to academic libraries, and how even though they can seem very different, your skills from one sector can be useful in another. All three of these short presentations were fantastic and, again, there were lots of questions and ideas being shared afterwards. After lunch, Darren Flynn explained how he teaches information literacy skills in his school library. He used an app that was new to most people in the room to deliver his presentation – it’s called Nearpod and it allows the presenter to share the presentation onto people’s devices, do polls and collect feedback. Darren explained how he can use Nearpod’s poll feature to assess the current knowledge level of the students in his class, and adjust his teaching accordingly. His presentation was very informative about things like differentiation and accommodating the needs of learners who may (for whatever reason) be uncomfortable with group work, paired work or standing up and speaking in front of the class. What was great was that Darren was really clear about how his tips and techniques can be used across any sector – my friend (a legal librarian) and I were both thinking of lots of ways in which we could apply what he was saying to our own teaching/training activities. The last hour of the day was for “speed networking”, with the attendees split into five groups, each of which sat at a table with a speaker who explained their role and answered any questions people might have. After ten minutes the groups moved round and met the next speaker. I was a last-minute addition to the list of speakers, and the others included Darren as well as a health information specialist, a legal knowledge manager, and a media manager for the BBC. I hope the attendees found this useful – obviously my experience of this was a bit different as I didn’t get to hear about the other speakers’ jobs. I think it was a great idea though, and was certainly a good way of quickly meeting a lot of people and introducing your line of work to them! Overall, the day was absolutely brilliant and I’m really proud to have had a hand in organising it. Massive thanks go to NLPN for their extensive events organisation know-how and all their hard work ensuring it went without a hitch, and of course to all the speakers for giving up their Saturdays to come to Sheffield and present to us! I came away with lots of ideas and enthusiasm for librarianship/info work and from what I’ve seen on Twitter I think a lot of the other attendees did as well. We’ve had a bit of a reshuffle at work and I’ve ended up with some slightly different responsibilities. I’m now going to be taking the lead on a project to redesign the teaching sessions we offer to PhD students. Talk about nerve-racking! This isn’t what I’d expected when I applied for this maternity-cover post at all – not that I’m complaining, but it’s a big thing for a temporary person to be in charge of. As a newly-minted librarian fresh out of library school, this is my first big project and, really, my first challenge too. I’ve done stuff that’s been quite scary this year, such as teaching, contributing to research, and creating online resources, but it’s all been stuff that I’ve done before, just on a slightly larger scale. Organising a project, delegating responsibilities, and developing a teaching programme that will be delivered to at least 400 people?! This is new. And very big. It’s all a bit daunting. I’m really excited about the whole thing, of course. I’ve already got stuck in and written an action plan with lists of “deliverables” and dates and things, and I’m looking forward to getting everyone involved in the project. I’ve been doing some background reading and research and am feeling like we’re going to end up creating something that really works. It’s just… it’s a lot of responsibility and I don’t want to get it wrong! My colleagues are of course very supportive and willing to help out, but I’m still really conscious that they’ve been doing this sort of thing for longer than I have and they have tons more experience than me. But I suppose everyone’s got to start somewhere, and I’ll never know whether I’m good at managing projects if I don’t ever take one on. It probably doesn’t help that I just went on the public library catalogue to see if they had any project management books, and it suggested I refine my search to “suspense fiction”, “thriller” or “horror”. No, seriously. I learned something new about EndNote again yesterday and wanted to share it. At this rate, I’m going to have to make this a regular series: “things I didn’t know you could do with EndNote”. Yesterday I met a PhD student who’d asked me to help her out as she was having trouble getting started with EndNote. After we went through the basics, she asked if there was a way of creating a reference list in Word without having to insert EndNote citations throughout her text – as she’d already written most of her thesis and didn’t want to have to go back over the whole thing to sort out the citations. I had no idea whether you could do this or not but found two different solutions, one of which is perfect for her situation. Solution 1) Make sure you’ve got all your references ready in your EndNote library. Make sure the Output Style is the one you want to use. Select all the references you want to use for your reference list. Right-click on the selected references and choose “Copy Formatted”. Open up your Word document and paste in the reference list. Voila! The reference list is inserted as plain text, so if there are any errors you have to delete the reference, change it in EndNote and copy and paste it all over again. This solution was perfect for my student, who didn’t have time to do what I probably would have done, which would be inserting EndNote citations throughout each chapter and then cutting and pasting the automatically generated references into a separate document. This solution would also be useful for people who want to create an annotated bibliography and have already got all the references in EndNote. Solution 2) This is slightly different, and is more useful for people who are creating bibliographies at the end of a document, and want to include references for things they haven’t cited in their text. Go to the end of your text and insert a citation for the item you want to include. Right-click on the citation and select “Show Only in Bibliography”. It’s as easy as that! The citation will disappear, but the reference will stay in your reference list. If you have to do it for multiple items, it’s easiest to choose “Edit and Manage Citations” from the EndNote tab on the Word ribbon. 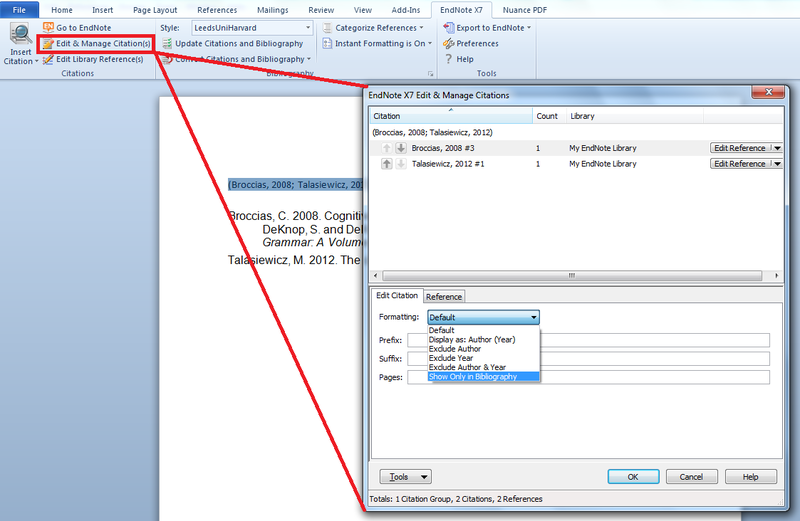 Then, you need to select each citation in turn from the list in the box that appears, and choose “Show Only in Bibliography” from the Formatting drop-down menu for each citation. Once you’ve done them all, press OK and your citations should all disappear. Like my previous post about EndNote, I’m sure this isn’t a new tip for everyone! However, it’s something I’ve not come across before and it might be helpful to others out there who are struggling to wade through the EndNote manual. Letters from the Library by Emily Wheeler is licensed under a Creative Commons Attribution-NonCommercial-ShareAlike 3.0 Unported License.